Herzog & de Meuron’s striking “Jenga” condo tower at 56 Leonard Street in Tribeca is a conversation piece on its own, with its cantilevered rectangles of glass rising into the sky. The long-anticipated flourish that will anchor the skyscraper–artist Anish Kapoor’s reflective bean-shaped sculpture–is finally on the way, as evidenced by an intricate set of circles and arrows that just arrived on the building’s sidewalk. 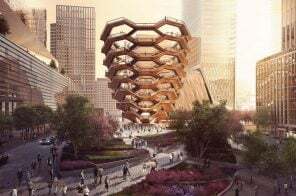 The spray-painted outline will inform installation of the sculpture, which resembles a similar public art icon in Chicago, where Kapoor’s “Cloud Gate” sculpture apparently attracts millions of tourists every year and has become an Instagram staple. 56 Leonard is one of NYC’s most exciting recent architectural additions. Dreamt up by Herzog & de Meuron, the skyline-altering condo tower rises 57 stories with an undeniable acrobatic grace, carefully staggering its floors in a cantilevering Jenga-like configuration that also appears to be in perfect equilibrium. Although the project developed by the Alexico Group and Hines took nearly a decade to build, a new video (h/t The Real Deal) released by the developers fast tracks the long and arduous process, neatly wrapping up 10 years of work into just over 60 seconds. Even after countless big ticket closings at blockbuster buildings like 432 Park Avenue and The Greenwich Lane, the long-admired Robert A.M. Stern-designed, Zeckendorf-developed 15 Central Park West (15 CPW) remains king. According to CityRealty’s latest CR100 report—an index comprised of the top 100 condominium buildings in Manhattan—units in 15 CPW sold on average for $6,735 per square foot over 12 months, a number that is impressively higher than the index average of $2,824. Tribeca’s Herzog & de Meuron-designed “Jenga tower,” 56 Leonard also made its debut on the latest CR100, clocking an average price per square foot of $2,657. 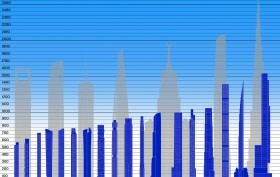 Echoing 6sqft’s recent post on global supertalls, the infographic above illustrates how when the height of New York’s tallest towers are stacked up against the sky-high constructions abroad (and 1 WTC), our city’s skyscrapers truly are “runts on the world’s stage.” The image also reveals that not only do these towers lack significantly in height, but also in girth. 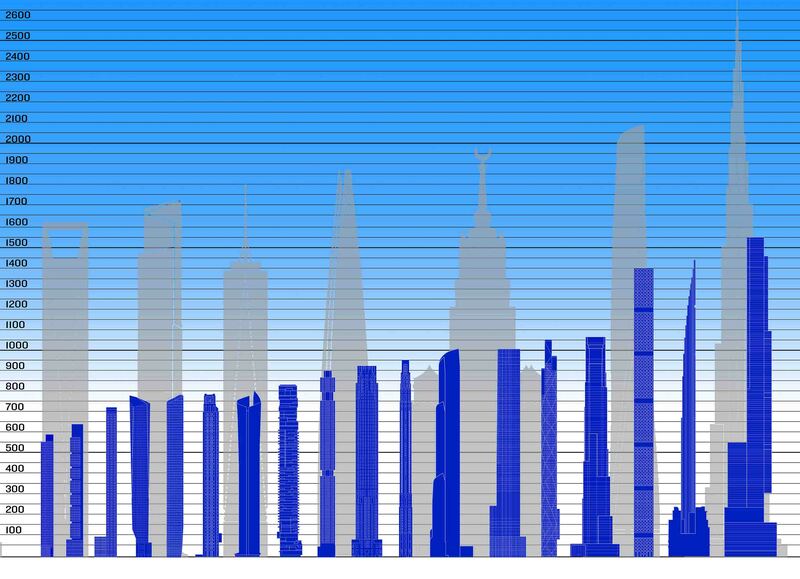 This means what really makes the design of all of New York’s new skyscrapers so unique is not how tall they are, but rather, how slender they are. 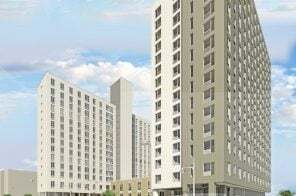 Last January, 6sqft reported on the the progress of Alexico Group /Hines’ project 56 Leonard: The concrete structure was around 700 feet tall with little more than 100 feet to rise. 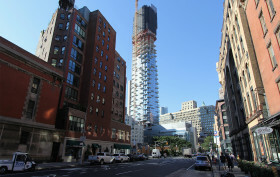 Now, alas, the 821-foot Tribeca tower, playfully known as “the Jenga building” and designed by Swiss architects Herzog & de Meuron, has finally topped out! With a delivery date expected sometime next year, all that remains for its wacky floor plate configurations and erratic cantilevered projections is the remainder of its exterior cladding, which we hear will now also progress from the top down, and the interior fit-out of its 145 residences. 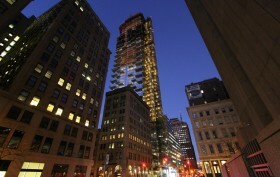 56 LEONARD CONSTRUCTION PROGRESS from Rob Cleary on Vimeo. 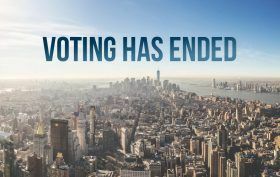 Esteemed architect and historian Robert A.M. Stern once said that “New York is a constellation of magic moments. 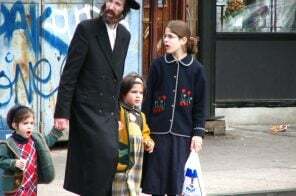 No city as complex as New York rebuilds itself so often, and often so well.” Two stars are being born in that nebula of irregular streets we call Downtown. 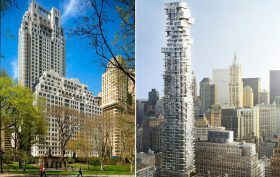 The taller of the two, 30 Park Place, is designed by the famed starchitect himself, and has recently surpassed its neighbor, the Woolworth Building, to soon take its place as the tallest residential perch in the district. The other star, 56 Leonard, may still shine brighter, however. While absent any height superlatives, 56 Leonard may very well end up being the most interesting skyscraper Downtown has produced in decades. Nicknamed the “Jenga-building” and the “tower of penthouses,” 56 Leonard’s design comes from the Swiss architectural firm of Herzog & de Meuron while working with the residential know-it-alls at Goldstein Hill & West. Currently, the concrete frame is approximately 700 feet tall with little more than 100 feet to rise before topping off. The floors progressively stagger at varying configurations creating cantilevered interior spaces as well as outdoor balconies for each of the residences. It seems like every week a new residential skyscraper is being announced in New York City, just earlier this week the New York Times noted that a partnership between Steven Witkoff and Harry Macklowe is moving ahead with a redevelopment of the Park Lane Hotel at 36 Central Park West with an 850-foot tower. 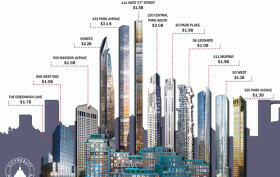 With the mind-boggling amount of residential spires poised to pierce the sky, here’s a quick rundown of the tallest of the tall–the spindly bunch set to soar higher than 700 feet. Keep in mind that just 30 years ago, the tallest residence in the city was perched atop the 664-foot Trump Tower. 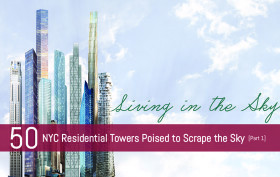 Today, buildings are on the drawing board for more than twice that height.